Psittacine Beak and Feather Disease or PBFD is caused by a circovirus which infects and kills the cells of the feather and beak. The virus also impairs the immune system. Consequently many diseased birds succumb to bacterial and other infections. 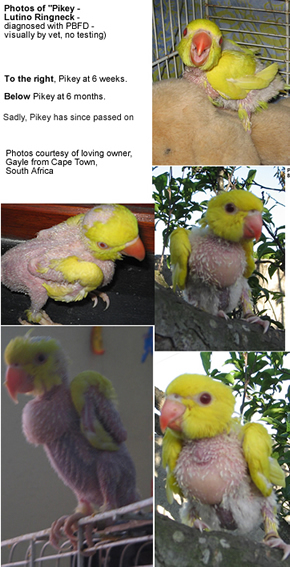 This disease has first been noticed in cockatoos, but has since been diagnosed in many species of birds, specifically in African Greys, cockatiels, budgies, Eclectus parrots, lovebirds, macaws, and Rosellas. 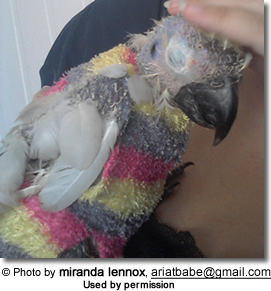 African greys are particularly badly affected. PBFD normally results in the death of affected birds and the decimation of young birds in infected collections. Chronically affected birds become immunosuppressed and may succumb to other diseases due to their depressed immune system. A positive result from a bird with no feather problems may mean either that the bird is a carrier or that it has been recently exposed to the virus. In these cases it is best to isolate the bird and re-test in about 90 days. The second sample should be collected by venipuncture to ensure that contamination does not occur. The majority of birds which are merely exposed will mount an immune response and eliminate the infection. Those still positive at the second test should be considered as carriers. One day they are likely to show the disease, and be potentially infectious. PBFD is one of the diseases that can be passed from bird to bird and the risk of spreading this, or other diseases, is a good reason to quarantine any new bird that comes into your household. PBFD is extremely contagious and there is no known cure and vaccines are only now being developed. Birds carrying this disease may not show any symptoms until stress brings it out, but they may infect other birds before they become symptomatic. Often death is caused by a secondary infection due to the reduced immunity caused by PBFD. 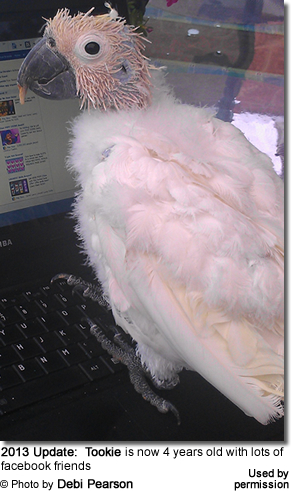 Very few birds survive PBFD although they may live a fairly long life with good care and very little stress. Supplementing with vitamins, minerals, and probiotics to boost the immune system will help, and treatment of secondary infections will be required regularly. According to Dr. Ross Perry FACVSc (Avian health) notes that some parrots presenting with acute to subacute disease made a clinical recovery just by being put on a "balanced diet", usually based on organic well-formulated pellets or crumbles supplemented with a little of a lot of fresh organic greens, vegetables and fruit, and given a little tender loving care for 1-2 moults. 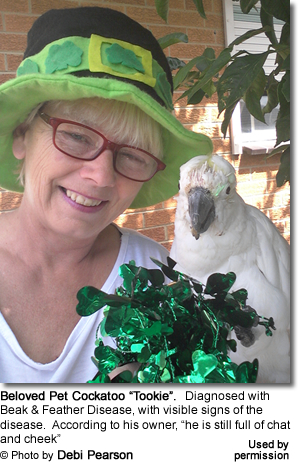 Providing supportive care helps birds focus all their energy on getting well. Feather Plucker or PBFD? Young chicks are not likely to pluck; so this would not apply to chicks. However, if an adult bird develops bald spots, you might consider either possibility. 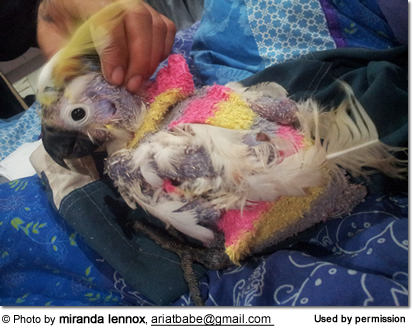 You can distinguish between PBFD and normal feather plucking by looking at where the feathers are being lost. If they are missing from the head and crest - an area they cannot get to with their beak to pluck - then it is likely to be Psittacine Beak and Feather Disease. may have feather shafts that often break, or you might see narrowing or pinching of the shafts (this condition worsens with each molt and your bird will usually become progressively balder due to inactivity of its feather follicles). may have a beak that is deformed, especially the upper beak, and often overgrown; the beak usually splits or breaks. Young birds suffer from an acute form of PBFD that occurs during their first feather formation, after replacement of down feathers. 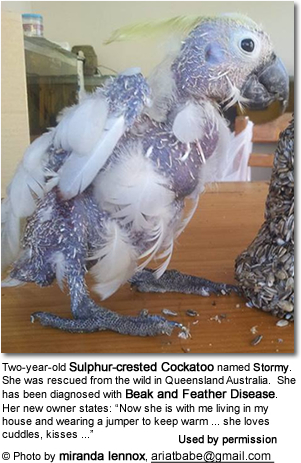 The developing feathers often fracture, bleed or fall out. Some chicks may die following a short period of anorexia (loss of appetite), depression and diarrhea, with very little feather abnormality.